The DRC provides highly skilled professional mediation services to people and organizations at all income levels in Grays Harbor County and Pacific County. Community Mediation is a conflict management process which allows collaborative problem solving and mutually satisfactory agreements. Most mediators at The Dispute Resolution Center (DRC) are volunteers; and all mediators are trained. Mediators are people from our community, who have completed many hours of intense conflict management and mediation training and extensive practicum before becoming certified mediators. Since our DRC is a non-profit organization, your tax deductible donations are welcome and very much appreciated. The Dispute Resolution Center provides mediation services to all persons without regard to financial circumstance. Mediation Fees are based on a sliding scale. Clients participating in mandatory small claims mediations are not required to pay a fee for mediation; those fees are included within the court's filing costs. A mediator is a neutral third party who assists two or more parties in reaching a settlement through collaborative dialogue. Mediation is a process of communication for people in dispute. Mediation creates a space for needs-based negotiation. Mediation is facilitated by an impartial third party professional. Mediation provides context and process for fully-engaged discussion between parties, i.e., plaintiffs and defendants. Mediation generates a Balance of Power between disputants. Mediation helps people to stay focused on relevant issues while addressing underlying interests. The goal of mediation is to reach mutually acceptable agreements. Agreements are usually intended to be a legally binding contract between parties. All mediation outcomes are voluntarily agreed upon by both parties. Mediation is the best choice for durable conflict resolution when the disputants must maintain a respectful, on-going relationship, i.e., co-parents, co-workers and neighbors. And yet, mediation is value for maintaining, restoring and developing all kinds of relationships. Mediation is beneficial because both parties work together to come to their own mutual agreement. The mediator does not decide how the parties should solve the problem. The mediators help people to resolve their anger so that they can talk calmly and work things out on their own. People only agree to solutions that they want to agree to. No one tells you want to do. No one has to make an agreement. Even when people don't think mediation is going help them, most people solve the problem and end up making mutually satisfactory written agreements. Most mediations are scheduled for two or three hours. Some mediations are scheduled for up to four hours. If the mediation is not resolved in the first four-hour session a second session will be scheduled. Fees for a second mediaiton sessions are priced twently percent less than the original mediation fee. What should people bring with them to mediation? Each party could bring pictures, letters, contracts or any type of record that could help Party-A understand Party-B's position in the dispute. Who should be at the mediation table? All the named parties in the dispute. Attorneys, if both parties are legally represented. Advocates (when preapproved by the mediator). Absolutely no children are permitted in the room during mediation. Mediation communications often begin with angry tones and adult conflict behaviors. These behaviors are unhelathy for children. Families involved in Divorce, sibling disputes, elder care issues, or putting together a parenting plan. When should people call a mediator? As soon as possible. Unresolved conflict can grow into serious, hurtful and expensive problems. The mediation process guides the parties toward a satifacory resolution before the the conflict causes permenant damage to the relationship. Mediation allows people to solve their own conflicts their own way. Mediation provides a process for more effetive3 communication whcih is respectful and encourages active listening. Each parties are acknowledged and understood by the other. Settlements are derived from needs-based conversation rather than debate. Settlements are created to meet the underlying interests of both parties. Mediation creates a win/win settlement agreement. Why is mediation (needs-based negotiation) a better way to resolve conflict? Some people are really interested in resolving conflict so they study conflict theory and become mediatiors. Mediatiors develop a rich understanding of why people fight and why at first some conflicts seem impossible to resolve. And yet, some conflicts cannot be resolved through needs-based negotiation, but most conflicts do resolve if both parties have the capacity to represent themselves honestly. People in conflict often come to mediation by court referral. However, many people decide to use mediation as soon as they notice their conflict is escalating or they are not resolving the conflict on their own. Mediation is a good choice when parties want to improve a family, neighbor or workplace relationship. Mediation outcome are mutually satisfactory agreements. Mediators help the parties reach solutions, but the mediator does not solve the problem. In fact, a good mediator does not share their ideas or opinions with the parties. Mediators are a neutral third-party. 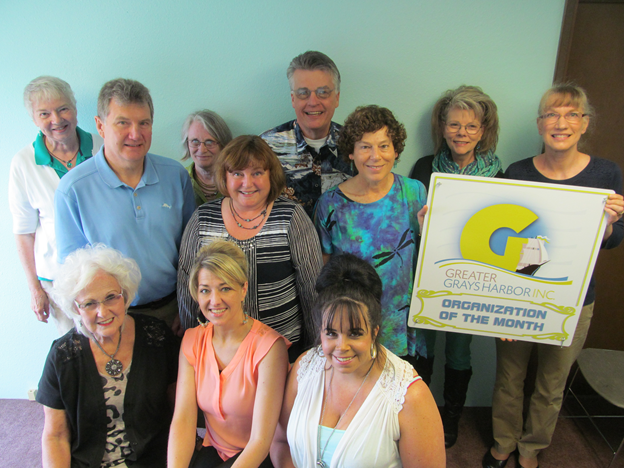 Greater Grays Harbor's Business of the month for August 2014!